One of prettiest signs of spring is a lilac tree in full bloom. Make a trip to Lombard, Illinois, and you’ll find a whole blooming town-full. Visit during the Lombard Lilac Time Festival, May 2-20, 2018, and you’ll not only enjoy flowering bushes, but fun events too. 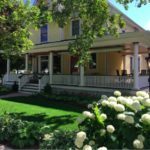 The Harrison House Bed & Breakfast in Naperville would be a great place to stay while taking in the fest and other area attractions—and it has a wonderful bygone-era appeal, just like lilacs! Lombard’s history with lilacs goes way back, specifically to the mid-1800’s, when a transplant from Chicago and his wife, William and Helen Plum, moved to town and bought an estate. 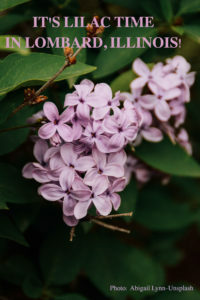 After seeing lilacs on a European trip, the couple purchased two plants, which were the beginning of their collection. The estate was renamed Lilacia, and so began the long love affair of Lombard and lilacs. Upon Mr. Plum’s death, his land and lilacs were willed to the town as a public park. Lilacia Park is truly a gift to all who visit, especially during festival time when the lilac trees are in full bloom. Begin the visit with a $5 of the park that includes access to the special History of Lilac Collection exhibit. Then stop into the Country Store in Lilacia Park to peruse its collection of Lilac Time merchandise. A full schedule of events can be found on the Lombard Lilac Time website, but a few of the featured ones include a softball tournament, beer tasting, pancake breakfast, and wine tasting. Park hours: daily, 9:00 a.m. – 9:00 p.m. Guests at the historic Harrison House Bed & Breakfast will find a welcoming home with elegant period décor and modern conveniences in each of the six en-suite rooms. Added enjoyments: a gracious wrap-around porch and delicious farm-to-table organic breakfasts. Harrison House Bed & Breakfast is a member of the Illinois Bed and Breakfast Association … a unique lodging experience! This entry was posted in Festival, Illinois Bed and Breakfasts, Illinois town of interest, Outdoor activities, Special event, Touring Illinois and tagged Festivals and events, Illinois Bed & Breakfasts, Illinois towns, Illinois Travel, outdoor activities, Summer activities by admin. Bookmark the permalink.